This is a brief guide to the nationally important collection of works by John Sell Cotman (1782 - 1842) at Leeds Art Gallery. Cotman is one of Britain’s most important artists and known worldwide for his watercolours and drawings. Leeds Art Gallery has one of the best collections of his work, including some of his finest watercolours and an unrivalled number of his sketchbook drawings. The majority of the works were collected by Leeds architect Sydney Decimus Kitson (1871 - 1937) and bequeathed by him to Leeds. Kitson devoted his retirement to researching Cotman’s life and work and in 1937 published ‘The Life of John Sell Cotman’. Kitson also gave Leeds his archive of notebooks, correspondence and research materials. He called it ‘Cotmania’. This website is an online catalogue of both The Cotman Collection and Kitson Archive. The catalogue has been arranged as a 'single search' platform where you can query both the works of art and archive material together as one repository. If you are new to using museum collections online please see our Search Guidance Notes. Cotman was born in Norwich, the son of a shopkeeper who turned from hairdressing to haberdashery. He came to London to further his artistic education in 1798, and soon became a leading member of the circle of watercolour artists gathered around Thomas Girtin (1775-1802), despite having little formal training. From 1803-5 he made annual visits to Yorkshire as drawing tutor to the Cholmeley family; the sketches and studies made there provided the basis for many of his best-known watercolours. On the formation of the Society of Watercolour Painters in 1804, some personal animosity prevented Cotman from joining, and he returned soon afterward to Norwich, where he became a popular teacher; he lent out monochrome and coloured drawings for students to copy from a 'Circulating Library' which came to number over 1,000 works. 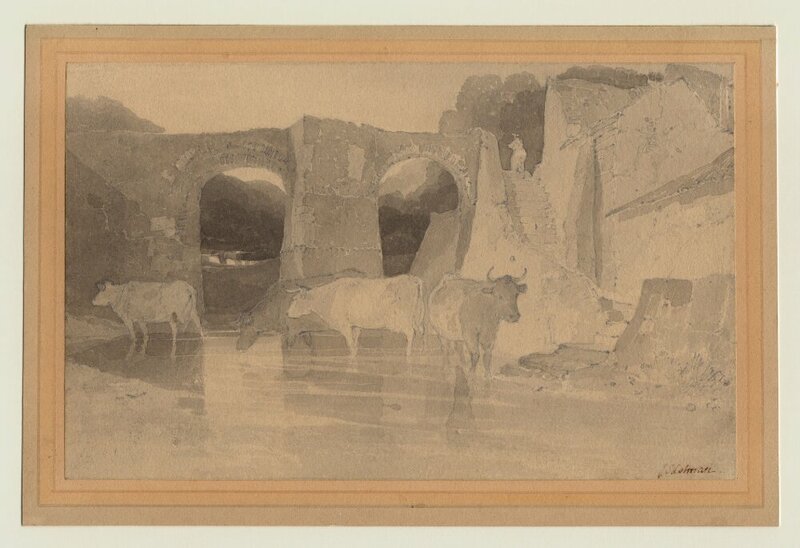 Cotman issued the first of his sets of etchings in 1811. The next decade, when he lived in Yarmouth on the Norfolk coast, was devoted almost exclusively to printmaking, inspired in part by the antiquarian interests of his patron and employer, the banker Dawson Turner. In 1817 Cotman made the first of three tours of Normandy, which resulted in two folio volumes of etchings, published in 1822. Following his return to Norwich in 1823, Cotman took up painting again with renewed energy, in watercolour and in oil; he exhibited more frequently in the city and also in London. In 1834, he was appointed Drawing Master at King's College School in London, and lived in Hunter Street, Bloomsbury. He made a final, extended visit to Norfolk in the autumn of 1841, not long before his death in London in July 1842. Video: 'British Masters: John Crome & John Sell Cotman', Norfolk Museums Service, 2012. 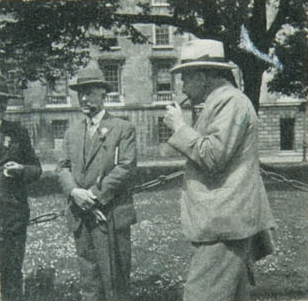 Image: Sydney D. Kitson (left) and H. M. Fletcher (right) at Trinity College, Cambridge. In 1896, Kitson and Henry Martineau Fletcher (1870-1953) a fellow architect and friend, embarked on an architectural sketching and study tour of the Veneto, the Dalmatian coast and Greece. Sydney gained experience of ecclesiastical architecture in the busy architectural practice of William Douglas Caröe (1857-1938) a major figure in the Arts and Crafts Movement, before returning to Leeds where he entered into partnership with architect Francis W. Bedford (1866-1904) from 1897 until Bedford left for London in 1904. Bedford was like Kitson the son of a successful Leeds manufacturer, in this case of chemicals and dyestuff. He was the star of his year, winner of the Royal institute of British Architects (RIBA) Ashpitel prize in 1890 and the Owen Jones studentship in 1891. He had been articled in Leeds to W. H. Thorp, the architect of the Leeds Art Gallery (1886-88), who was for many years an active member of the Leeds Fine Arts Club and the Art Gallery sub-committee of the City Council. The work of Bedford and Kitson was regularly reviewed and illustrated in the architectural press from 1893 and, except for some offices in the centre of Leeds; most of the buildings survive with at least their external features intact. 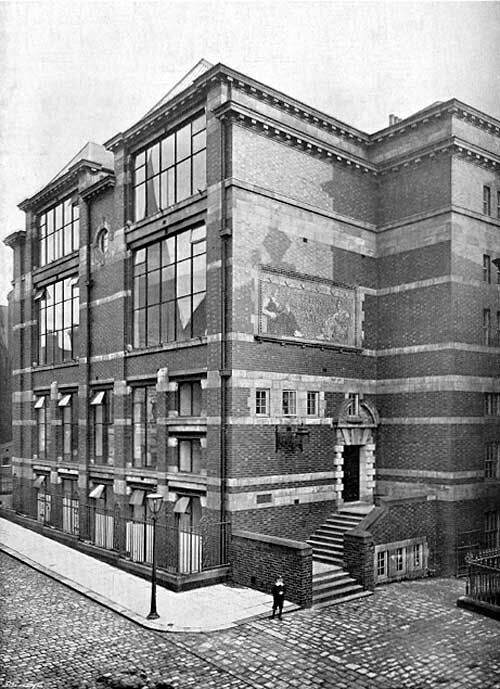 Image: 'Leeds College of Art and Design' designed by Francis W. Bedford and Sydney D. Kitson in 1902. © Leeds Library & Information Services. Sydney lived at Hillside, Glashow Lane, Leeds, from 1901-1915. On 21st February 1903, aged 31, Sydney married Margaret Winifred Tetley (1879-1932) of the Tetley brewing family, at St. Michael’s Church in Headingley, Leeds. Following the marriage, and the birth of their two daughters, Elisabeth and Barbara, in 1905 and 1907, he began alterations of Hillside making one room of the whole front of the ground floor and building on a modern dining room and nursery. By 1914, Sydney had a successful architectural practice and a new partner James Parish. Sydney was elected a fellow of RIBA in 1906 and a fellow of the Society of Antiquaries in 1907. He was President of the West Yorkshire Society of Architects from 1910-1912 and during this time, served on the RIBA council. In 1911Sydney was co-opted onto the Art Gallery sub-committee of Leeds City Council from which he only resigned due to ill health in 1934. Sydney’s service in the Great War from 1914-19 was with the Yorkshire Hussars, rising from Captain in 1914 to Major in 1919. Robert had a passion for English watercolours and through sketching with Sir Alfred East and Brangwyn and later Philip Wilson Steer and Sir George Clausen, he became an accomplished painter. With his close friend, Cecil A. Hunt (1873-1965) he went sketching almost every year in ltaly, Sicily, Southern France and to North Africa, where he wintered in Kairouan and Luxor. Both were elected to the Royal Society of British Artists and exhibited at the Royal Academy, the Fine Art Society, and the Redfern Gallery. 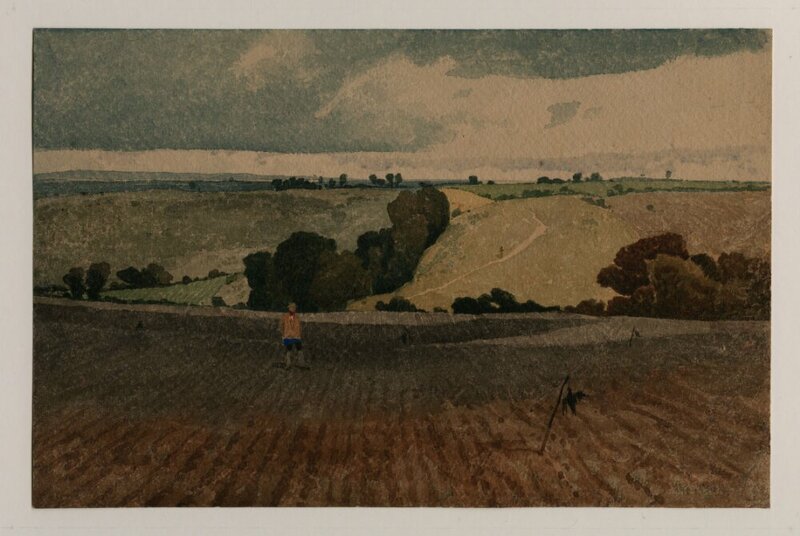 Hunt was Vice-President of The Royal Water-Colour Society from 1930-1933. James Reeve was one of the first to recognise the importance of John Sell Cotman's watercolours and his efforts to establish Cotman as a major artist were endorsed by the British Museum who purchased a substantial part of his collection which Laurence Binyon assessed in 1897. Post-war interest in the artist was rekindled in a comprehensive exhibition of work by the Cotman family at the Tate Gallery in 1922 with a linked display in the British Museum Print Room. In that year Leeds Art Gallery bought its first work by Cotman, a watercolour of ‘Pont Aber Glaslyn’. The second, ‘A Coal Shaft at Coalbrookdale’ then called 'The Brick Kilns', was presented by Sir Michael Sadler on leaving the position of Director at Leeds Art Gallery for Oxford in 1923, and in the same year a third water-colour, ’The Ploughed Field’, was purchased. Despite his illness, Sydney Kitson was remarkably active and sustained by his daughters, especially after the sudden death of his wife in February 1932. Throughout much of his quest for Cotman, he also served as the Honorary Secretary of the RIBA from 1928 with two annual extensions until 1934 when illness forced him to relinquish such duties in London and Leeds although he continued his task of sorting out the collections deposited in the RIBA library. Source: 'Cotmania and Mr Kitson', Leeds Art Gallery, Corinne Miller (1992). The Cotman Collection at Leeds is one of the best collections of works by John Sell Cotman, including some of his finest watercolours and an unrivalled number of his sketchbook drawings. The most obvious impression is of the intimate character of the work. The majority of the works in the Leeds collection are informal sketches, made to serve as rough thoughts and references at the heart of Cotman’s imaginative processes. It is widely understood Leeds collection is unique in this respect. Although similar material may be found in other collections, nowhere is there such a sustained body. Cotman devised a system in his studio for organising his sketchbook drawings and reference material into categories which was posthumously dismantled and hitherto a largely unknown characteristic of his practice. During the course of a recent research programme funded by The Esmée Fairbairn Collections Fund we have been able to work out a means of reconstructing the original sheets on which the original groups of sketches were mounted. This has already revealed several interesting aspects of Cotman’s approach. For one thing, he was surprisingly (even ruthlessly) unsentimental about his sketches. He would quite happily sacrifice a major drawing on one side of a sheet for something relatively minor on the other, where one still held artistic potential. For another he could be remarkably oppositional in his choice of subject-matter, for yet another he set remarkably high standards of visual discrimination. The result is that his drawings have merits and subtleties only perceptible to the most expert of viewers. It is clear that the sketches in the Leeds collection contain much material to interest specialists in many areas. Quite apart from the wonderful topographic and architectural material that can be expected, the largest group of subjects studied thus far are ships and boats. Cotman was a man of the Norfolk Broads, and knew the river traffic well, but he was also an amateur sailor, quite capable of venturing onto the open sea. He lived for twelve years in a house overlooking the port of Great Yarmouth and he made sailing tours with his sons down the Suffolk Coast to London, the Thames and the Medway. As a result the collection contains a fairly comprehensive visual encyclopaedia of North Sea vessels, both working and naval. This is a rich collection for the marine historian or enthusiast. Other areas of specialist interest include a fine group of drawings of coaches and carriages for example, that will be valuable to the transport historian. There are numerous studies of farmyards, carts, waggons, tools and implements that will be valuable to the agricultural historian. There are also dozens of lively and characterful figure studies that will interest anyone interested in social history. There are also dozens of studies of works by other artists. We have been able to identify the subjects of these, many for the first time. These document Cotman’s artistic framework, and greatly amplify his imaginative and technical context. One theme that emerges very strongly through this aspect is his focus on colour. Very many of his sketches have extensive annotations, and these almost exclusively concern colour. It is evident that Cotman was acutely sensitive to the poetry of colour both in its most subtle combinations and patterns, and also in its most powerful. Many of the sketchbook drawings in the Leeds collection relate to works in other collections and in Cotman’s wider oeuvre. The sheer number of sketchbook drawings make it possible to associate works with sketches elsewhere, to begin to assemble groups of related works across collections, and also to find very many instances of sketches at Leeds providing the basis of finished compositions, or details in finished compositions elsewhere. The Kitson Archive is comprised of material generated and accumulated in the course of Sydney Decimus Kitson’s life, namely, as a scholar and collector of the artist John Sell Cotman. The way The Kitson Archive is organised – its hierarchy (or levels), and where your record sits within this hierarchy - will give you additional information about the record’s meaning. This is the 'top level' of description and typically describes a whole collection, e.g. 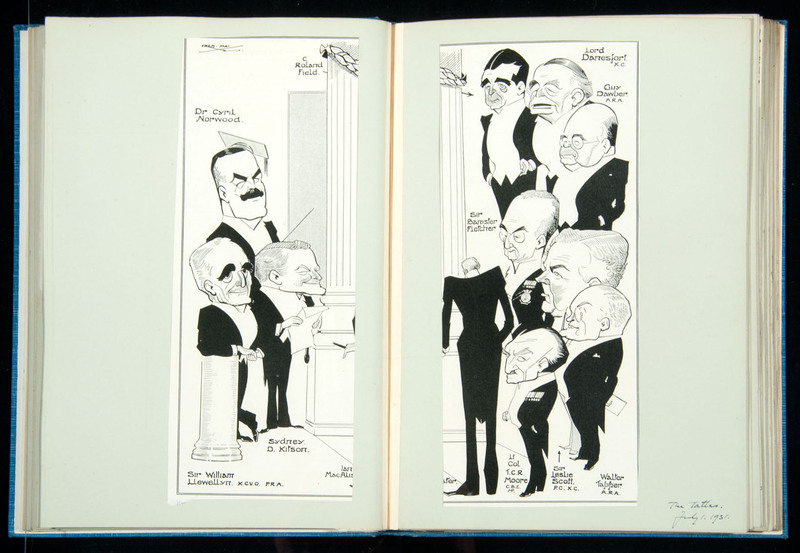 the Sydney Decimus Kitson Archive and its ‘creator’. The 'top level' may exist on its own in isolation; but often there are 'lower levels' of the collection, such as series, contributing to the whole description. The ‘creator' is the individual or organisation responsible for the creation, accumulation, or assembly of materials into an archive. An archive collection usually has a common provenance or point of origin, and therefore a recognised creator or creators. For example, the creator of the Sydney Decimus Kitson Archive is Sydney Decimus Kitson, although he did not write or create all the individual items within the archive. This is the 'middle tier' between the top level and an individual item level description, e.g. the ‘Posthumous Papers’ (of Sydney Decimus Kitson). Typically it is a series, sub-series or file. The description may or may not then have lower individual item level descriptions. This is typically the lowest level of description. An 'item' within an archive typically represents one single physical entity. 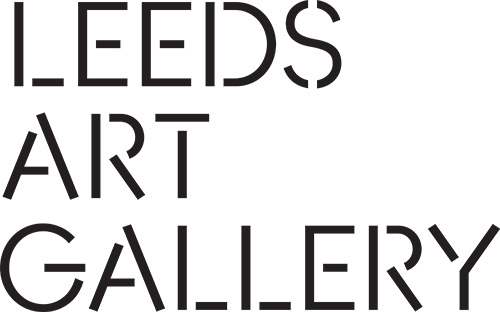 Sometimes files are described as individual items. This is not an exact science due to the complex nature of archives and the choices made as to how to represent the hierarchy. For example, in the Kitson Archive Cotmania Volumes each individual page has been catalogued (and transcribed) to item level. This catalogue has been arranged as a 'single search' platform where you can query both the works of art and archive material together as one repository. Start your search here https://cotmania.org/search. Enter your search term(s) to begin. As you type you will see the search results instantly update. Your search term(s) are shown inline with the results, highlighted in yellow. This helps you to see how your search term(s) have been used within the context of the catalogue and quickly assess the relevance of the results. You can choose to search for a phrase by adding quotation marks to your search to find both terms in the specified order, for example: "Colman Collection" or "art historian". If you are looking for a specific item and know its reference or accession number enter the number using quation marks, for example: "LEEAG.1922.0300" or "SDK/1/3/3/10". By default our search engine performs an AND search, so brandsby and cholmeley gets the same results as brandsby cholmeley. You can exclude records from the results containing specific term(s) by entering the prohibit operator, the - symbol, before the term(s). For example: the query Colman - Collection will retrieve records containing the term Colman but not Collection. Very common words without relevant meaning such as the, if, a, and, at, of... are intelligently handled and removed from the query before searching. For example, a search for hickman of thonock or hickman thonock will get the same results, as will thonock of hickman. Add quotation marks to get an exact phrase match, for example: "hickman of thonock". There are two options with which to display the search results. The first, by default, is the Gallery View that shows the results as a lightbox. The second is the List View that emphases the textual details over the image of the items/works. Click the and icons towards the top right of the search results to switch between the views. Our search engine provides a number of filtering options, so that you can perform a broader search using term(s) and then narrow the results using dynamicly defined criteria. Click the icon towards the top left of the search results to begin filtering your search. The filter options are prioritised by the number of occurrences against your search term(s). For example if there are more instance of John Sell Cotman over Joseph Mallord William Turner, Cotman will surface at the top of the list. As you refine your search the options will be instantly revised against the search results. Using the filter options you can filter the search results by date. Click and drag the Date Range slider to narrow and expand the search period. The Cotman Collection and Kitson Archive are name rich, i.e. they are full of the names of people and organisations. Locally, we describe these as Constituents. It is a continual project to index every constituent, a project which continues even today. However, many constituents have been identified and indexed against the collection. Look for and click the icon towards the top right of the search results to explore the collection by constituents. Here you can see every named person and organisation in the collection thurs far indexed. This list can be narrowed by entering search term(s) or explored by simply scrolling through the list. Click the constituent to see their profile and a small selection of items relating to them. Here you can build a new search using the constituent as the primary criteria. Just click the link to search for works of art and archive items linked to the constituent. Searching collections and archives for women can be problematic. Most women’s names appear with surnames and titles only, and no first name, i.e. Mrs or Miss (or Misses if referring to several unmarried women) and so. This can make it harder to search for them. Once a woman marries her maiden name disappears, again making it hard to trace her. Where possible our cataloguers have added in women’s first names and maiden names. In many instances where the viewpoint for a work of art is identifiable we have recorded the latitude and longitude to map the collection and allow for geospatial search. Look for and click the icon towards the top right of the search results to explore the collection by place. You can explore the map using the or in the lower right corner to zoom in or out. Touch capable devices pinch two or more fingers together, or spread them apart, to adjust the zoom. To pan press and hold the mouse button (left button for Micorsoft Windows users) whilst moving the cursor. With touch capable devices use two fingers to pan. Click on the icons to reveal the works and click the work's title to see its full catalogue entry. Both the Cotman Collection and Kitson Archive are held by Leeds Art Gallery and can be accessed in the Study Room by anyone, free of charge. You will need to make an appointment well in advance of your visit with the reference / accession numbers of the items you wish to see. Please note that in accordance with the Data Protection Act, some items from the Kitson Archive may not be available to view. All applications to undertake research should be made in the first instance to the Collections Team at Leeds Art Gallery by email (city.art.gallery@leeds.gov.uk).